It has been a year since our initial mobilization around the idea of a Civic Hub. A number of us continued meeting throughout the 2018 and worked on grants, connections and the first vision statement: A home, a landmark, accessible to everyone interested in civic and grassroots groups to showcase what is being done in the community, to allow groups to support each other, recruit, communicate and build credibility and capacity for advocacy and delivery of services to the community. The number of small groups and organizations interested in the initiative is growing. 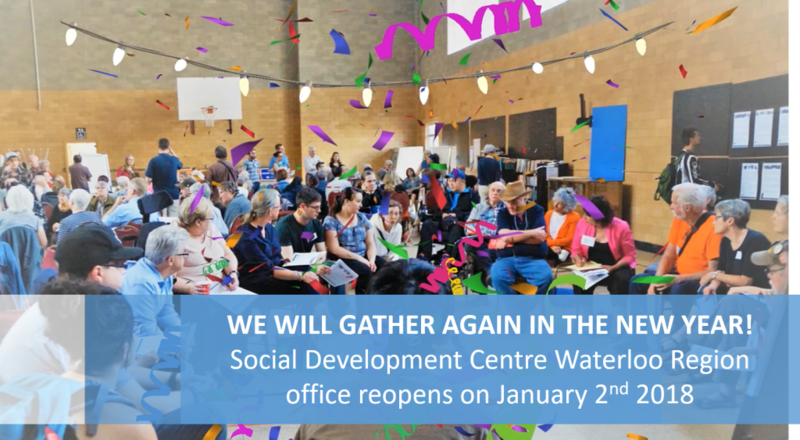 A number of projects bringing together ethnocultural groups in Waterloo Region in 2018 testified that common, affordable space is a foundation for communication, collaboration and growth for many groups who feel isolated, under-resourced and in constant competition for supports. However, there is little understanding of the core work that civic groups and small non-profits do in Waterloo Region. We can learn together with other non-profit networks who want to create hubs for their sectors, such as WR Environmental Network and WR Arts Council. Our strength is in our diversity and our common vision. On January 21st 2019, we will gather again to share updates and brainstorm ideas about the next steps in creation of a Civic Hub. Entrance and doorbell on Duke St.
RSVP by January 15th. Please get in touch if you need more information or have ideas/comments to share before the 21st. Wishing you only the best to come in 2019. Your Voice and Your Donation Count!